E.P. 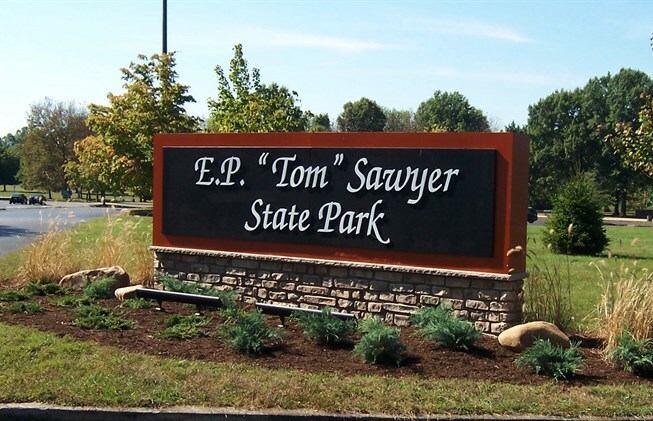 "Tom" Sawyer State Park is a 550-acre park in Louisville, located off of Westport Road in the Freys Hill neighborhood. Opened in 1974, Tom Sawyer Park was established on land previously owned by Central State Hospital, and named after Louisville native Diane Sawyer's father, Jefferson County Judge/Executive Erbon Powers "Tom" Sawyer. Amenities at Tom Sawyer Park include two hiking trails: a 1-mile Fitness Trail where all can enjoy the various maples, oaks and sycamores along the way, then stop at the fitness area for strength and cardio training; and the 1.25-mile Goose Creek Trail, where hikers can happen upon American turkeys, several wild birds, and white tail deer appearing from the woods and grassy meadows. Dog owners can bring Fido and Fluffy to the dog park in the northeast corner of Tom Sawyer Park. The six-acre facility is split into three two-acre tracts: one for dogs under 30 pounds, and two for all dogs. You can also keep their leashes in your bag, as the park is an off-leash zone -- the first of its kind in Louisville. Access is available with a membership to the Louisville Dog Run Association. Stargazers can keep looking up with the Louisville Astronomical Society's monthly Star Parties. The free events at LAS' astronomy center at Tom Sawyer allow any and all to bring their telescopes and binoculars to see the amazing wonders in the night sky. Space programs and telescope lessons round out the offerings. Athletic types have a wide range of activities awaiting them at Tom Sawyer, from basketball and archery, to soccer and BMX; the BMX course at the park is one of the best in the nation, and is host to the National BMX Grand Championships every Labor Day weekend. Hobbyists also have a home at Tom Sawyer. Gardeners can purchase a plot for the season for $32, growing whatever they desire while socializing and sharing tips with other gardeners. Meanwhile, the skies above the radio-controlled airfield are perfect for testing and flying their RC model airplanes. You'll never run out of things to do at Tom Sawyer Park. In March and April respectively, the annual Irish Classic 10K and Goose Creek 5K challenges runners as they attempt their personal best. Archery camps and lessons throughout the year help prepare future Katniss Everdeens for the winter archery competition in January. The Inflatable 5K isn't so much a run as it is a a bouncy good time, and is a great way to welcome the summer every June. And if you ever wanted to get married at Tom Sawyer, the annual wedding show at the Sawyer Hayes Community Center in January can give you a few good ideas on how to plan and spend your special day.